Our 4 bedroom, 3 bathroom villa is pefectly set up for families, sleeping 8/10, and offering a high standard of accommodation, including a southwesterly facing pool and spa. The property benefits from wonderful, uninterrupted views across a lake and woodland. So enjoy the views until sunset as you relax in the Florida sunshine! The villa is in a quiet location and fully equipped throughout, including cable TV in every room, access to free Wi-Fi and local calls and a games room offering pool, table tennis, air hockey and darts. Disney World and the other major attractions are just a short drive away, as well as numerous golf courses. We are close to supermarkets, bars and restaurants and there is even a family friendly pub within easy walking distance! High Grove Resort is relatively new, and has a unique Mediterranean feel to it. It is a small, friendly, gated community that is maintained to a very high standard. The onsite clubhouse offers all guests free use of its gym, a large communal pool and a children’s play area. 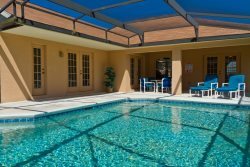 Local mangement is through "Homes of America" who maintain the villa and pool to the highest of standards and are on hand to offer advice during your stay. They are also able to arrange welcome packs and offer discounted tickets for the theme parks. We hope you enjoy our villa as much as we do. It is a lovely property, in a peaceful community setting, yet close to the many attractions that Florida has to offer. We have set out the key features of the villa below but please do not hesistate to ask if you have particular questions.